75 of Trump’s Top Antichrist Jews | Have Ye Not Read? 1Jn 2:18 Little children, it is the last time: and as ye have heard that antichrist shall come, even now are there many antichrists; whereby we know that it is the last time. In other words, if you deny the Lordship of Jesus Christ, then you do not have the Father, no matter how “godly” you might claim to be. After all, Christ and the Father are one (John 10:30; John 14:8-9). You can’t deny the Son and claim to have the Father at the same time. It just won’t fly. Rev 3:9 Behold, I will make them of the synagogue of Satan, which say they are Jews, and are not, but do lie; behold, I will make them to come and worship before thy feet, and to know that I have loved thee. Part of the inheritance of the saints, beloved, is that the antichrist Jews will ultimately be under our command, and not above us. Of course, we know the false Jews — who are actually descendants of Satan’s son Cain (I John 3:12; John 8:44) — love “the highest seats” (Luke 20:46) and always work to gravitate into positions of power. 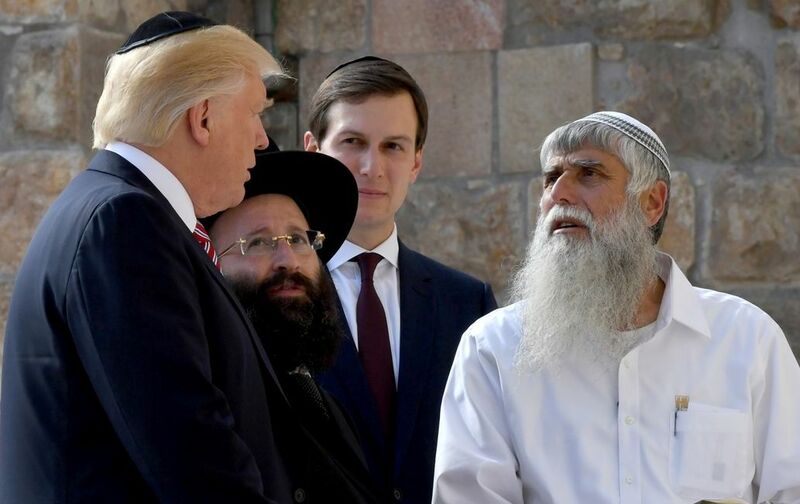 Jared Kushner — Trump’s son-in-law, senior adviser to the president tasked with bringing “peace” to the Middle East; orthodox Jew and good friend of Israeli Prime Minister Bibi Netanyahu. Yael Kushner — aka Ivanka Trump, Executive Vice-President of The Trump Organization, senior advisor to the Donald J. Trump for President Executive Committee, senior member of the Trump Presidential Transition Team. Converted to Judaism in 2009 so she could marry Jared Kushner, upon which she took the Hebrew name Yael (apparently after the Biblical wife of “Heber the Kenite”). The name Yael means “mountain goat,” whereas the surname Kushner means “fur skinner.” Hold on to your fur beloved, it only gets worse from here. Charles Kushner — New York Real Estate Developer, father of Jared Kushner, convicted of illegal campaign contributions, tax evasion, and witness tampering; served 14 months in prison; endorser of Donald J. Trump for President; donor to the Make America Great Again PAC; Ashkenazi Jew. Vanessa Trump — endorser of Donald Trump for President; previously married to Donald Trump, Jr.; her father was a Russian Jew. Wilbur Ross Jr., — former senior managing director of Rothschilds Incorporated for 25 years, donor to the Trump Victory Fund, member of the Trump Economic Advisory Council, now Secretary of the U.S. Department of Commerce; Ashkenazi Jew. Steven Wynn — Billionaire real estate tycoon, and Financial Vice-Chairman of the Trump Presidential Inaugural Committee; Ashkenazi Jew. David Friedman — long-time Trump attorney, co-chairman Israel Advisory Committee for Donald Trump, now U.S. Ambassador to Israel; son of a conservative rabbi. Steven Mnuchin — former Goldman Sachs Chief Information Officer, donor to Trump Victory Fund, worked as Trump’s national finance chairman during the campaign; now U.S. Treasury Secretary; grandson of Russian-born diamond dealer Aaron Mnuchin; Skull and Bones member since 1985; Ashkenazi Jew. Carl Icahn — Special Adviser on Regulatory Reform to Donald Trump, 26th wealthiest person on Forbes 400, well-known billionaire; Ashkenazi Jew. Gail Icahn — Finance Vice-Chairman, Trump Inaugural Committee; Ashkenazi Jew. Gary Cohn — former Chief Operating Officer Goldman Sachs, now head of the White House National Economic Council, founder of the Cohn Jewish Student Center at Kent State University; Ashkenazi Jew. Boris Epshteyn — New York-based investment banker and finance attorney; senior advisor Donald J. Trump for President, now Special Assistant to the President; Russian Jew. David Shulkin — former president Beth Israel Medical Center in New York City, now the Undersecretary for Health at the Department of Veterans Affairs; Ashkenazi Jew. Reed Cordish — real estate mogul and friend of Jared Kushner, now Assistant to the President for Intragovernmental and Technology Initiatives; Ashkenazi Jew. Avrahm Berkowitz — first cousin to former AIPAC president Howard Friedman, now serving as Special Assistant to President Trump and assistant to Jared Kushner; Ashkenazi Jew. Lewis Eisenberg — chairman, Trump Victory Committee; former Goldman Sachs employee and Private Equity Chief for Granite Capital International Group; major contributor to groups backing Trump’s election; now U.S. Ambassador to Italy under the Trump administration; holds an Honorary Doctor of Humane Letters Degree from the Rabbinical College of America; Ashkenazi Jew. Michael Glassner — Deputy Campaign Manager and National Political Director for Trump campaign, known for his experience in Jewish voter relations; outspoken supporter of Israel; former political director AIPAC; Ashkenazi Jew. Miriam Adelson — endorsed Donald J. Trump for President; appointed Finance Chairman for the Trump Inaugural Committee; Ashkenazi Jew. Sheldon Adelson — Billionaire Las Vegas casino mogul, endorsed Donald J. Trump for President, largest financial donor to the Trump campaign; appointed as Finance Vice-Chairman for the Trump Inaugural Committee; Ashkenazi Jew. Paul Atkins — former SEC commissioner during the time leading up to the 2008 financial crisis in which housing loans were packaged as securities (i.e., stocks) and sold to investors for exorbitant sums, ultimately resulting in the market crash; now a member of President Trump’s Strategic and Policy Forum; Ashkenazi Jew. Brian Ballard — Dubbed “the most powerful lobbyist in Trump’s Washington” by Politico magazine; Finance Vice-Chairman of the Trump Presidential Inaugural Committee; Ashkenazi Jew. Elliot Broidy — Vice-Chairman Trump Victory Committee; Finance Vice-Chairman Trump Presidential Inaugural Committee; Ashkenazi Jew. Safra Catz — Israeli-born American business executive; head of Oracle Corporation; sixth wealthiest woman CEO of a Fortune 500 company; Executive Committee member, Trump Presidential Transition Team; Ashkenazi Jew. Michael Cohen — Executive Vice-President and Special Counsel (i.e., lawyer) to the Trump Organization; political “fixer” now caught up in a massive payment scandal, not to mention the alleged “Stormy Daniels” affair payoff; Ashkenazi Jew. Delos Cosgrove — Former Cleveland Clinic CEO, member of President Trump’s Strategic and Policy Forum; Ashkenazi Jew. Gil Dezer — Israeli-American real estate developer; president of Trump-Dezer Development; Ashkenazi Jew. Michael Dezer — founder of Trump-Dezer Development; “known for his investments in New York and Florida real estate in association with Donald Trump” (Wikipedia); Ashkenazi Jew. Stephen Feinberg — Billionaire financier, donor to Trump Victory Fund; member Trump Economic Advisory Council, head of the President’s Intelligence Advisory Board; Ashkenazi Jew. Larry Fink — CEO Blackrock; member of President Trump’s Strategic and Policy Forum; Ashkenazi Jew. Alan Fishman, chairman Ladder Capital; Trump’s second largest lender; Ashkenazi Jew. Samuel Fox, vice-chairman Trump Victory Committee; Ashkenazi Jew. Alan Garten, Executive Vice President and Chief Legal Officer at The Trump Organization; Ashkenazi Jew. Bruce Geld, endorser of Donald J. Trump for President; Ashkenazi Jew. Lawrence Glick, Executive Vice-President of Strategic Development for The Trump Organization; Ashkenazi Jew. Jason Greenblatt, Executive Vice-President and Chief Legal Officer to Donald Trump and The Trump Organization, co-chairman Israel Advisory Committee for Donald J. Trump, now Special Representative for International Negotiations to President Trump; Ashkenazi Jew. Vincent Harris — former Digital Strategy Manager, Donald J. Trump for President; Ashkenazi Jew. Thomas Hicks, Sr., — billionaire private equity investor, Finance Vice-Chairman Trump Inaugural Committee; Ashkenazi Jew. Robert Eager, chairman and chief executive officer of The Walt Disney Company, member of President Trump’s Strategic and Policy Forum; Ashkenazi Jew. Travis Kalanick — co-founder of Uber; member of President Trump’s Strategic and Policy Forum; Ashkenazi Jew. Peter Kalikow — President of H. J. Kalikow & Company, LLC, one of New York City’s leading real estate firms; donor to the Trump Victory Fund; Ashkenazi Jew. Daniel Kowalski — Deputy Policy Director of the Donald J. Trump for President Committee; member of the Trump Economic Advisory Council; Ashkenazi Jew. Bennett LeBow — Chairman of the Board of Vector Group; former owner of the Liggett Group, the fifth largest cigarette company in the U.S.; testified under oath that “since cigarettes are a legal product and people choose to use them, whether or not they cause cancer is irrelevant” (Wikipedia); friend of Ukrainian mob boss Vadim Rabinovich (Wikipedia); donor to the Trump Victory Fund; Ashkenazi Jew. Richard Lesser — member of President Trump’s Strategic and Policy Forum; Ashkenazi Jew. Ronald Lieberman — Executive Vice-President of Management and Development for The Trump Organization; Ashkenazi Jew. Howard Lorber — President and CEO of Vector Group, donor to the Trump Victory Fund, member of Trump Economic Advisory Council; Ashkenazi Jew. David Malpass — member of the Trump Economic Advisory Council, serves as Under-Secretary of the Treasury for International Affairs under President Donald J. Trump; Ashkenazi Jew. Douglas Manchester — donor to the Make America Great Again PAC; Trump’s nominee for Ambassador to the Bahamas; Ashkenazi Jew. Bernard “Bernie” Marcus — Home Depot co-founder; co-founder of the Israel Democracy Institute; endorser of Donald J. Trump for President; donor Rebuild America Now PAC; donor Make America #1 PAC; Ashkenazi Jew. Rebecca Mercer — Mercer family heiress; dubbed by Politico magazine as “the most powerful woman in GOP politics” and as a political “kingmaker” by Town and Country magazine, and said to have been “quietly pulling strings for the Trump campaign”; donor to Make America #1 PAC; Trump Executive Committee member; member of the Trump Presidential Transition Team; Ashkenazi Jew. Robert Mercer — Father of Rebecca Mercer (see above); co-CEO of Renaissance Technologies, a hedge fund, donor to the Make America #1 PAC; Ashkenazi Jew. Amanda Miller — Vice-President of Marketing for The Trump Organization; Ashkenazi Jew. Eli Miller — Chief Operating Officer, Donald J. Trump for President; Ashkenazi Jew. Jason Miller — Senior Communications Director of the Trump Presidential Transition team; Communications Director and Assistant to the President at the White House; Ashkenazi Jew. Stephen Miller — National Policy Director, Donald J. Trump for President; National Policy Director Trump Presidential Transition Team, Senior Advisor to the President for Policy at the White House; Ashkenazi Jew. Samuel Nunberg — Political advisor to Donald J. Trump for President; Ashkenazi Jew. David Orwitz — Senior Vice-President of Acquisitions and Development, The Trump Organization; Ashkenazi Jew. John Paulson — Known as “one of the most prominent names in high finance”; donor to the Trump Victory Fund, member of the Trump Economic Advisory Council; Ashkenazi Jew. Laura Perlmutter — Wife of Isaac “Ike” Perlmutter, an Israeli-American businessman and financier, CEO of Marvel Entertainment. Laura donated $449,000 to a PAC supporting Donald Trump and was Finance Vice-Chairman of the Trump Inaugural Committee; Ashkenazi Jew. Richard Roberts — Vice-chairman, Israel Advisory Committee for Donald Trump; Ashkenazi Jew. George Ross — Executive Vice-President and Senior Counsel for The Trump Organization; Ashkenazi Jew. Steven Roth — Donor to the Trump Victory Fund; member of the Trump Economic Advisory Council; Ashkenazi Jew. Keith Schiller — former Deputy Assistant to U.S. President Donald Trump who concurrently served as Director of Oval Office Operations; Schiller also served as the Director of Security for The Trump Organization (personal bodyguard to Trump). He has been described as “one of Trump’s most loyal and trusted aides” and “a constant presence at Trump’s side for nearly two decades”; Ashkenazi Jew. Stephen Schwarzman — CEO of the Blackstone Group; chairman of President Trump’s Strategic and Policy Forum; Ashkenazi Jew. Peter Thiel — Billionaire venture capitalist, co-founder of PayPal, endorsed Donald J. Trump for President, donor to the Trump Victory Fund, donor to the Rebuilding America Now PAC, Executive Committee Member of the Trump Presidential Transition Team; Ashkenazi Jew. Kevin Warsh — Former governor of the Federal Reserve System during and in the aftermath of the 2008 financial crisis; acted as the central bank’s primary liaison to Wall Street; now a member of President Trump’s Strategic and Policy Forum; Ashkenazi Jew. Mark Weinberger — Global Chairman and CEO of EY, formerly known as Ernst & Young; member of President Trump’s Strategic and Policy Forum; Ashkenazi Jew. Andrew Weiss — Executive Vice-President of The Trump Organization; Ashkenazi Jew. Allen Weisselberg — Executive Vice-President of Development and Acquisitions at The Trump Organization, and Chief Financial Officer for The Trump Organization; known as “Donald Trump’s Loyal Numbers Man”; Ashkenazi Jew. Larry Weitzner — CEO of Jamestown Associates, one of the nation’s premier political consulting firms; advisor to Donald J. Trump for President; Ashkenazi Jew. Daniel Yergin — A director on the Council on Foreign Relations; member of President Trump’s Strategic and Policy Forum; “In December 2016 Yergin joined a business forum composed primarily of CEOs assembled to provide strategic and policy advice on economic issues to President Donald Trump; Ashkenazi Jew. Yes, as St. John wrote in 1 John 2:18, “…even now are there many antichrists; whereby we know that it is the last time.” And so it is, beloved. And so it is. Think carefully about who and what you throw your support behind. There are no “good” antichrists, so don’t give me that “good fig/bad fig” stuff. If they hate the Lord, they hate the Father. If they hate the Father, and you support them, then…well…I’ll let you think that through for yourself.